Easter (probably Easter 1956; actual size approx. 7.7 x 9.5 in. (19.5 x 24.2 cm.)). 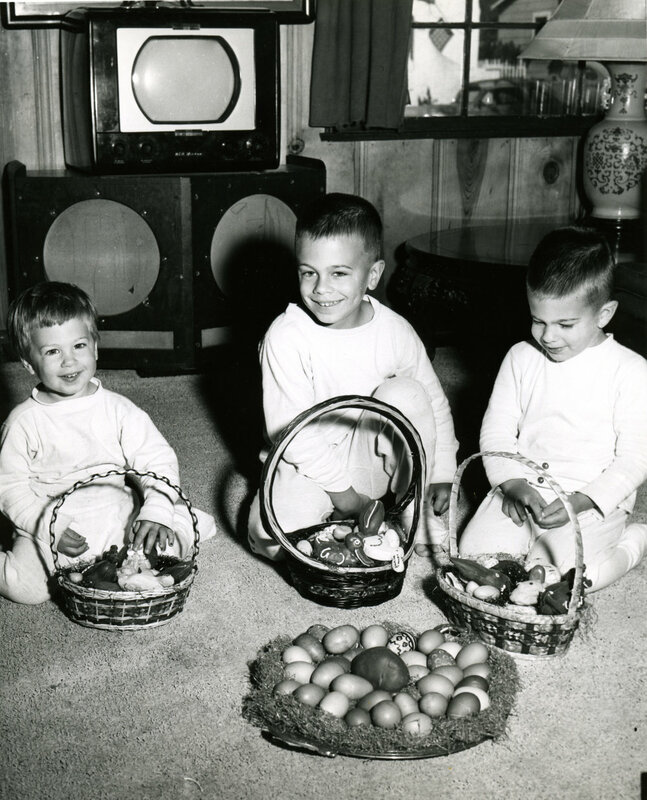 Paradoxically, I found many more Easter photos in the family albums than photos of Christmas—enough to make me wonder why Easter was such a big deal in our household, given our secular upbringing. But no matter; I'd much rather talk about the way this photo affords a good look at a number of pungently nostalgic pieces of the period: the old RCA Victor black-and-white television with round picture tube and bakelite knobs, sitting atop a speaker system that my father cobbled together from old theatre drivers (and which yours sincerely defaced with graffiti using crayons). Just to the north, a finely crafted circular Chinese table assembled entirely with dovetails (no nails), on which sits a gorgeous vase, then used as a lamp base, with celadon green and cobalt blue glazes. I'm happy to say that both pieces now reside in my living room.